The yogi looking for a practice that will help them build strength and stamina while still getting in touch with their mind and spirit will love a Vinyasa flow. The dance-like practice is focused on connecting breath to movement, creating a fluid motion as you move between each posture. Breath is essential in this practice, as it brings you to the present and creates serenity in the mind. The Warrior flow outlined below is a great way to fit some Vinyasa yoga in on your own time, and helps you practice each of the strength-building Warrior postures. As an intermediate yogi, you are likely familiar with the postures incorporated in the below flow. However, before diving into it, it is important to get a full picture of some of the core poses and sequences included in it. This breakdown will give you a deeper look into the key components of the flow so that you can approach the practice more mindfully. 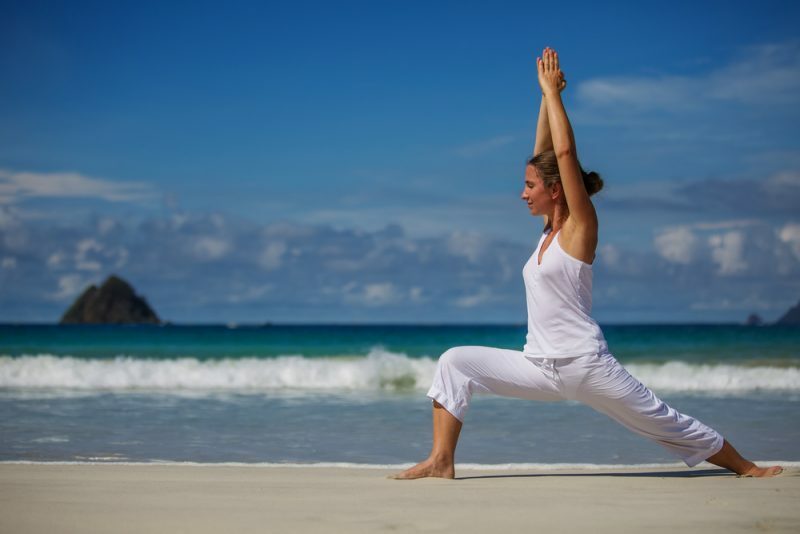 Warrior I, or Virabhadrasana I, helps to stretch and lengthen the hip flexors and quadriceps. The sequence below adds a chest expansion, which helps deepen the stretch in the shoulders and chest, and overall opens up the heart space. From a standing position, bring your left foot back behind you and place it flat on the ground. Turn the toes out slightly to the left so that they are on a diagonal line, at approximately a 45 degree angle. Your left foot should be fully on the floor. Your front right knee should be bent and stacked over the ankle, and the right toes should be facing directly forward. The hip bones should be on an equal plane, facing forward. Adjust the length of your stance as needed to ensure the hips are properly positioned. On an inhale, bring your arms up above your head. Be sure that your shoulders are relaxed and away from your ears. On an exhale, bring your arms behind your back and interlace your hands. As you squeeze your palms together, roll your shoulders back and feel the stretch in the arms, shoulders, and chest. Lengthen your spine on each inhale, and bend further back on each exhale. 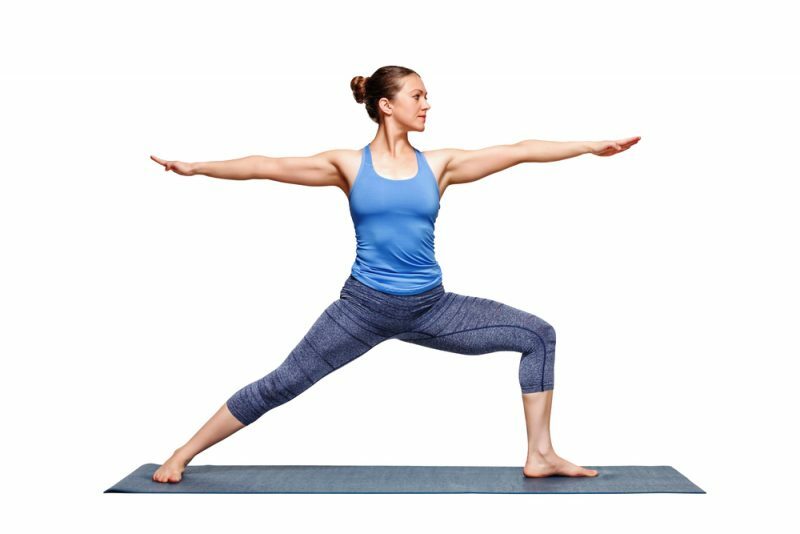 Warrior II, or Virabhadrasana II, helps to build stamina and body awareness while strengthening the legs, core, and arms. Begin standing facing the side of the room, with the outer edge of your left foot paralleling the front edge of your mat. Step your feet about three and a half to four feet apart, keeping them aligned. On an exhale, bend into your left knee, working towards creating a 90 degree angle with your shin perpendicular to the floor and your thigh parallel. Your knee should align directly over your left ankle. Adjust your foot positioning as necessary. Warrior III, or Virabhadrasana III, focuses more intensely on balance than the other two Warriors. Besides enhancing your balance, it activates and strengthens the core, legs, and arms. Start in Warrior I, with your right leg in front. On an exhale, begin to shift your weight forward onto your right foot, and lift your left leg off the ground as you straighten your right leg. Work towards bringing your left leg high enough so that it is parallel to the ground. Your left toes should be facing down, and your hip bones should be on the same plane, both facing forward. Your gaze should be down, as you work towards creating a straight parallel line from the top of your head to your left heel. There are a few arm options you can take with Warrior III. The full expression requires you to extend your arms straight in front of you at ear level. You can also modify by extending them straight behind you, or bringing them into prayer position at your chest. In the flow below, you will be instructed to do the pose with a chest expansion, but you can take on any arm variation that works best for you. Like Warrior III, Standing Splits pose, or Urdhva Prasarita Eka Padasana, challenges your balance. It also tones and strengthens the legs, feet, and ankles. Begin in Warrior III, with your right leg in front. Begin to tilt your torso down while keeping your hips on the same plane, and place your palms onto the mat. Continue to lift and lengthen through your extended left leg. Reverse Warrior, or Viparita Virabhadrasana, provides a nice stretch to the chest and side body, and also strengthens the legs. It is an essential part to nearly every Warrior flow. Begin in Warrior II, with your right leg in front. 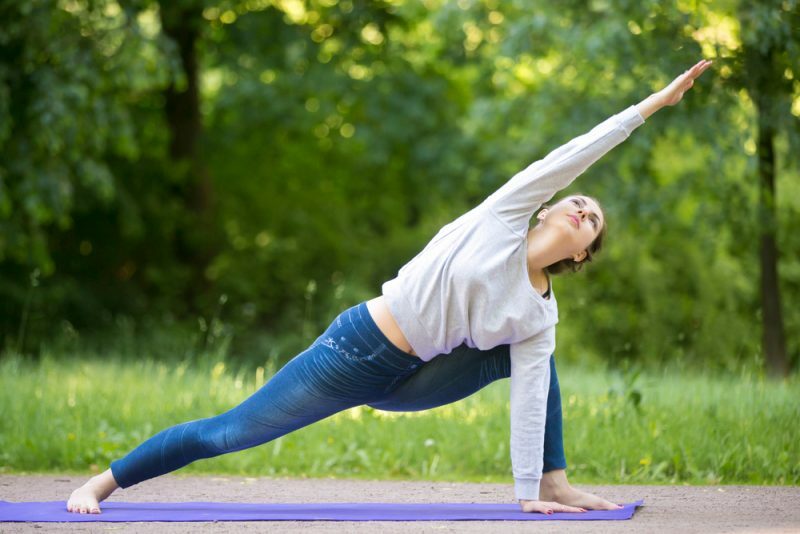 Keep your hips facing to the side, and begin to lift your right arm up to the sky, while simultaneously extending your left arm down to your back leg. Your legs should remain in the same position, continuing to bend through the right knee. Continue to lengthen your right arm up as you deepen the stretch in the side body. Ensure your left side body remains lengthened, rather than crunched towards your left hip. Your shoulders should also remain away from your ears. When you are instructed to move through a Vinyasa, it simply means to complete a specific series of poses that bring you to Downward Facing Dog. It is often used to transition from one sequence of postures to another. To move through a Vinyasa, move into Plank Pose (Palakasana) from whichever pose you are in. Move to a Four Limbed Staff Pose (Chaturanga Dandasana) by shifting your weight forward, bending your elbows, and lowering your body towards the ground. Straighten your arms and push your torso forward into an Upward Facing Dog (Urdhva Mukha Svanasana), and then push back into Downward Facing Dog (Adho Mukha Svanasana). Sun Salutation A, or Surya Namaskar A, benefits the body in countless ways: it works the core, stretches the hamstrings, and loosens the shoulders, while also energizing and engaging the mind. This sequence of poses is extremely common in Vinyasa classes, and is featured in the below flow. Start in Mountain Pose (Tadasana) at the front of your mat. Move to Upward Salute (Urdhva Hastasana), and dive down into Forward Fold (Uttanasana). Lift your torso up into Half Forward Fold (Ardha Uttanasana), and then fold back down and move into Plank Pose. Move through your Vinyasa, and push back to Downward Facing Dog. 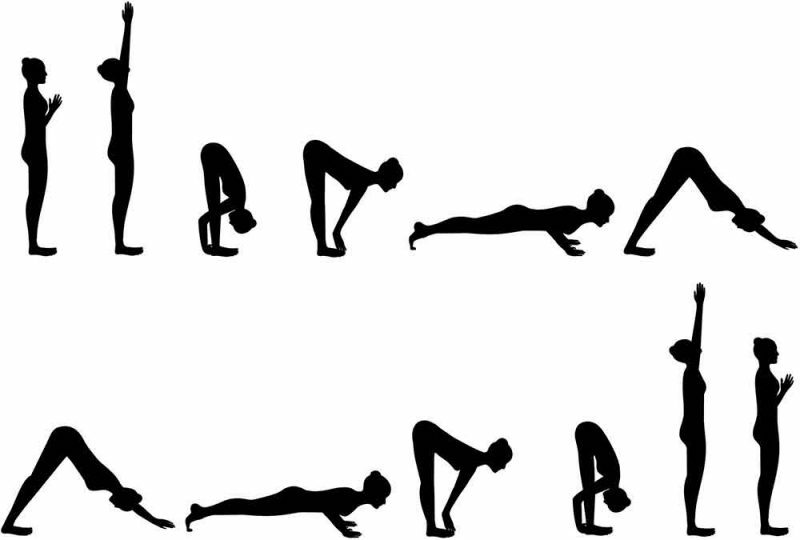 Often you will move onto the next posture from Downward Facing Dog, but to finish Sun Salutation A, you will move through Forward Fold, Half Forward Fold, Forward Fold, Upward Salute, and then end in Mountain. Now that you have the foundation of some of the key poses, you can move into the Vinyasa flow. Use this sequence as a guide, and remember to listen to what your body needs. You can adjust the flow as you see fit. If you need to reconnect with your breath, take a break in Child’s Pose (Balasana), or a more active rest in Downward Facing Dog (Adho Mukha Svanasana). Each posture should be performed with one breath to one movement, unless otherwise noted. Start on your hands and knees, and begin to alternate between Cat and Cow (Marjaryasana). Feel the stretch in your spine, back, and shoulders, and take any organic movement that feels good to you. Continue for at least ten breaths, moving breath to movement. Place your hands firmly into the mat, and press back into Downward Facing Dog. Peddle out your legs to open up the back of your legs. Stay here for at least five breaths once you have found stillness. Next, roll forward into Plank Pose on an exhale. You shouldn’t have to adjust your hand and foot placement from Downward Dog, but reposition them as needed. On an inhale, roll back into Downward Dog, again not moving your feet and hand positioning. Repeat this three times, and end back in Downward Dog. Step forward and move through Sun Salutation A. End back in Downward Dog. Extend your right foot behind you, and bring it into your chest on an exhale, hovering your knee and foot above the ground. Extend it back up, and bring it into your chest two more times. After the third time, extend once more and then step it forward in between your hands. Rise up into Warrior II, with your right leg bent in front of you as you gaze over your right fingers. On an exhale, reach your right fingertips forward and move into Extended Side Angle. On an inhale, reach your right arm up into Reverse Warrior. Sweep your arms forward and place them on either side of your right foot. Step back into plank, and then move through your Vinyasa. Once back in Downward Dog, repeat the Sun Salutation and Warrior II sequence on your left side. As you finish your left side, go through the Sun Salutation and Warrior II sequence two more times, once on your right and once on your left. From Downward Dog, sweep your right leg up behind you, and move into Warrior I on an inhale. On an exhale, sweep your arms behind you and clasp your hands together near your sacrum. Hold this chest expansion for three breaths. At the bottom of your third breath, begin to shift your weight into your front right leg, and move into Warrior III on an exhale. You can keep your hands clasped behind you, or move into another arm variation. Hold for three breaths. From Warrior III, on an exhale, place your hands down on the ground to move into Standing Splits. Hold for three breaths, and then slowly begin to lift your torso up to stand up tall and bring your bent left leg into your chest, remaining balanced on your right foot the entire time. Gently straighten your left leg down and place your foot on the ground by your right, and swing your arms above your head into Upward Salute. Move into a Forward Fold and move through your Vinyasa. End back in Downward Dog, and repeat the Warriors and Standing Splits on the left side. Once you have completed your left side, repeat once again on both your right and left side, again ending back in Downward Dog. Come down onto your knees, and bring your legs out in front of you. Move into a Seated Forward Fold (Paschimottanasana), lengthening on each inhale and bending forward on each exhale. Stay here for five breaths. Come back up, and gently lay onto your back. Do a Reclined Spinal Twist (Supta Matsyendrasana) to the left side and hold for five breaths or more. Raise your knees back up, and repeat on the right side. Finally hug your knees into your chest, and release into Corpse Pose (Savasana), remaining for a minimum of twenty breaths. This Vinyasa Warrior flow is an excellent sequence for someone looking to get a well-rounded practice in on their own time. Before you go about your practice, establish a quiet area without distractions so that you can be fully present in the flow.